Russian Pavlovo Posad - products with a unique design (shawls, wraps, scarf, pashminas, head scarves, neckerchiefs) made of natural fibers: wool, cotton, silk. Each model is unique, has its own name and the author-artist. Color: black shawl & multicolour pattern. Material: compacted 100% wool + fringe of silk knitted by hand, forming several rows of cells. Model 1122-18 / Schastlivica / Lucky girl. Dimensions: 58.3x58.3'' (148х148cm). Pavlovoposadskiy Platok Schastlivica - best accessory: light and warm, exclusive image, delicate and beautiful. 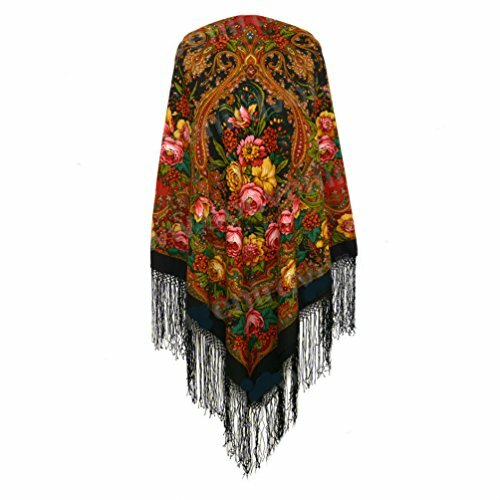 Made in: Russia Pavlovo Posad Shawl Manufacturers. If you have any questions about this product by Pavlovo Posad 58x58'', contact us by completing and submitting the form below. If you are looking for a specif part number, please include it with your message.